Your Winston Churchill FREE Coin is a true commemoration of Britain’s greatest wartime Prime Minister. 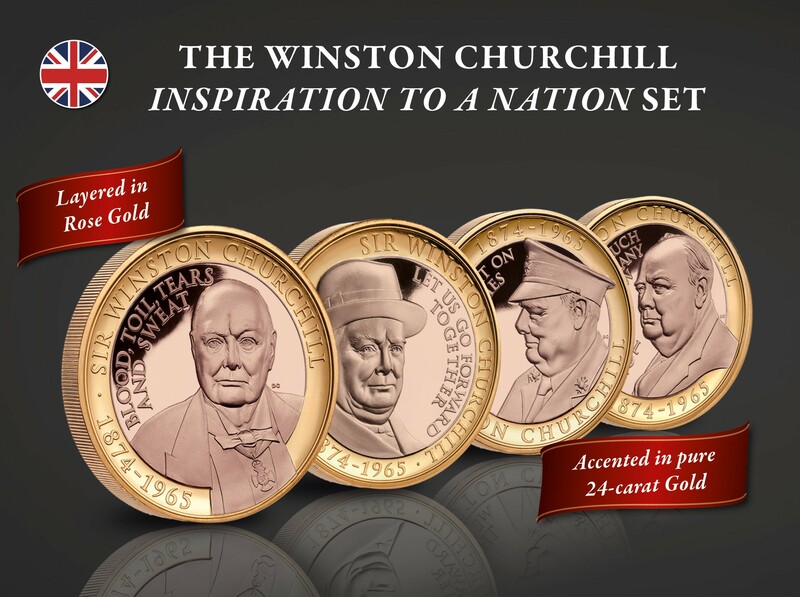 Complementing the coin that you already own, the Inspiration to a Nation Set includes four limited edition coins that each individually pay tribute to the Churchill’s famous speeches. Commemorate the man who inspired the nation to “defend our island” and “never surrender”, by completing your Official Winston Churchill Inspiration to a Nation Set. The next coin in the set can be yours for just £29.95 (plus £2.95 P&P). You don't need to send any money now. Payment will not be due until you have received your coin and have made the decision to keep it. The remaining three coins in your set will be sent to you at monthly intervals, for the privileged price of only £29.95 (plus £2.95 P&P) each. Each coin will be sent entirely on approval and without obligation. You may return any coin within 14 days and stop collecting at any time. Your successful order of the FREE Winston Churchill Coin has guaranteed you access to the remaining four coins in this limited edition set. Beautifully layered in Rose Gold and accented pure 24-carat Gold, only a limited number of Winston Churchill Inspiration to a Nation Sets have been issued worldwide. Each coin comes with a Certificate of Authenticity, attesting to the specifications and edition limitation of the coin.